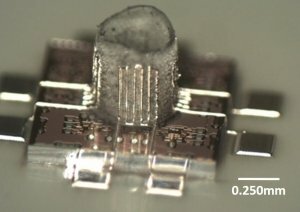 ALBUQUERQUE, New Mexico – August 16 , 2016 — Optomec, a leading global supplier of production-grade additive manufacturing systems for 3D printed electronics and 3D printed metals, today announced its Aerosol Jet Technology can enable 3D polymer and composite structures to be printed at the micron scale with embedded electronics. This breakthrough has significant potential to reduce the cost and size of next-generation products used in the electronics and bio-medical industries. This new capability is enabled by combining Optomec’s proven Aerosol Jet solution for fine feature printing with a proprietary in-situ curing capability for rapid on-the-fly solidification. Unlike other high resolution 3D printing approaches that deposit material globally, ie: in a powder bed, and then cure locally to define a pattern, the Optomec method relies on both local deposition and local curing. This makes the process more economical, in terms of material consumption, but is also key to enabling the highest resolution features available. Using this process high aspect ratio, free-form 3D structures can be printed at the micron-scale, without the need for support structures, from materials including photopolymers and certain composites. Additionally, the resulting structures can be metallized with conformal 3D conductive traces and printed functional components, such as antennas and sensors, to create fully functional 3D components all in one manufacturing machine. This direct digital approach optimizes the fabrication process, reducing manufacturing steps and material usage making Aerosol Jet 3D micro-structure printing a cost-effective, green technology. Aerosol Jet 3D micro-structure printing is capable of ultra-high resolutions with lateral features sizes down to 10 microns, and lateral and vertical build resolutions from 1 micron to 100 nanometers respectively. Aspect ratios of more than 100:1 have been achieved. Additionally, such 3D micro-structures can be printed onto existing components and products, such as semiconductor chips, medical devices or industrial parts. Click here to access a white paper on Aerosol Jet 3D micro-structure printing. Aerosol Jet 3D Printed Micro-structure showing freestanding, millimeter wave dipole antenna”. Photo courtesy of Optomec.